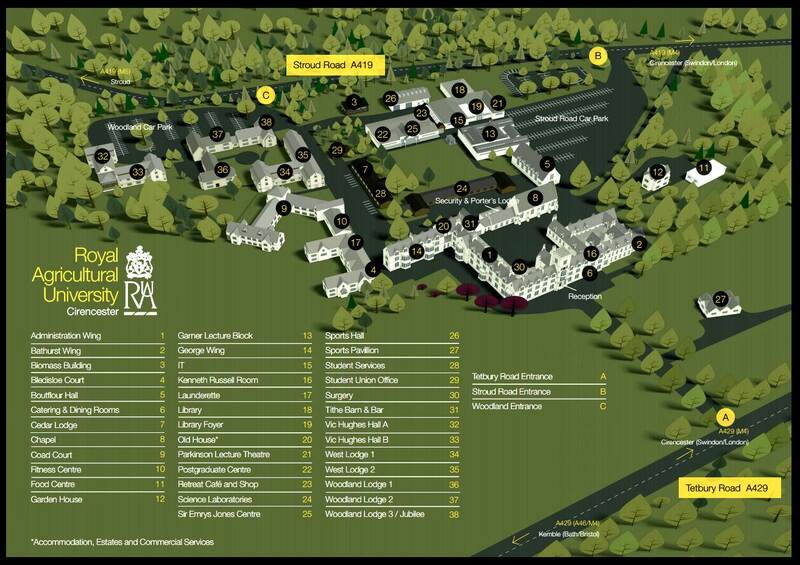 Read more about the residence halls on the Cirencester campus. Bledisloe Court is divided into six houses on three levels, each house has nine or ten standard single bedrooms with a wash basin. All houses have shared toilet and shower facilities. The rooms have a light, airy feel, some with views across farmland towards the neighbouring village of Coates, or looking towards the RAU campus. It has 59 standard single bedrooms. Coad Court is located centrally within the accommodation buildings and is split into 11 houses. Bedrooms are either single en-suite or standard single rooms containing their own wash basins, with access to shared toilet and shower facilities. Ground floor rooms are available with accessible facilities. These large rooms are bright, and some have stunning country views. It has 44 en-suite single and 9 standard single bedrooms. This is the oldest building in the University, dating back to 1845. It houses 33 spacious bedrooms of varying type, they are all en-suite single bedrooms. There is a large common room for use by Main Building residents. Please note that the main building is not suited for international students due to closure over Christmas period. Vic Hughes Hall 1 is a self-catered block, containing 26 quiet en-suite bedrooms, with accessible rooms available. Kitchen areas are shared between 10 students. Vic Hughes Hall 2 is a catered block with light and airy en-suite bedrooms. There is a communal lounge area on the ground floor. It has 26 en-suite single and 26 self-catered single bedrooms. This self-catered block contains 58 en-suite bedrooms divided across two halls, which have under-floor heating provided by the University biomass boiler. There is a communal lounge and kitchen on each floor, shared between 8 students. Accessible facilities are available. Its has 58 en-suite self-catered single bedrooms. Woodlands Lodge 1 and 2 provide large en-suite bedrooms over two storeys, with a common room and basic kitchenette for residents’ use. Some of these rooms may be used as en-suite twin bedrooms if required. Accessible facilities are available. Woodlands Lodge 3 has small en-suite bedrooms, located close to the main teaching blocks and the Bledisloe lawn. Woodlands Lodge 3 doesn’t have its own common room. It has 48 en-suite bedrooms. Garden House is a lovely 11 bed house, all standard singles with shared bathroom facilities, with a large kitchen and separate lounge area. This is a quiet block primarily for International students. There is a warm welcome awaiting everyone who comes to study with us from overseas. Click through to find the different accommodation fees. All RAU halls of residence are fully compliant with and covered by the Universities UK Accommodation Code of Practice.